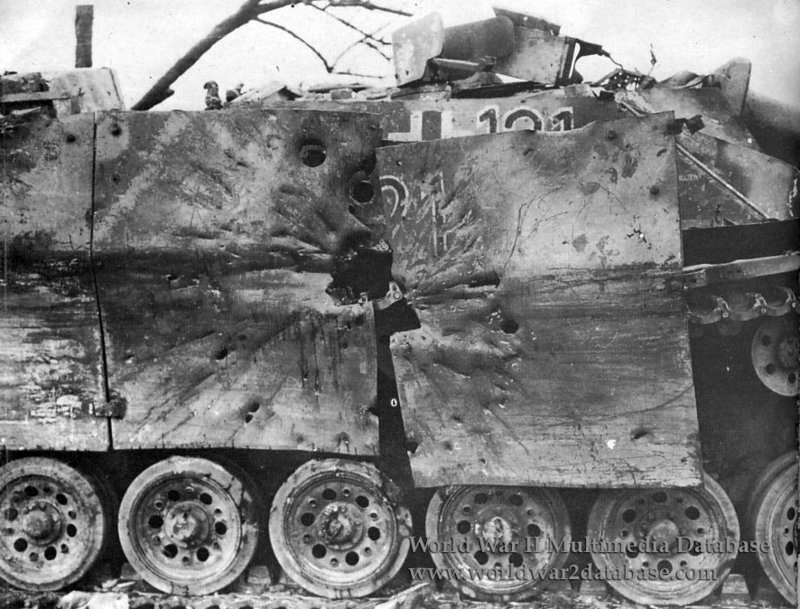 Sturmgeschutz III ausf G turmnummer (turret number) 121 hit by American anti-tank fire from the 4th Armored Division, XII Corps, 3rd Army. It appears the vehicle had been pierced at least three times. After a six week pause in offensive operations to recover from repelling the German offensive in the Ardennes, the 4th Armored Division joined the rest of XII Corps in pushing into Germany. On March 4, 1945, The Division was encamped near Bitburg, Germany (later to be made famous in 1985 as the proposed site of President Ronald Reagan's speech at the German War Cemetary, which contained SS graves). Over the next fifty hours, Brevet Lieutenant Colonel (later Major General and Army Chief of Staff) Creighton W. Abrams Jr. (September 15, 1914 - September 4, 1974) drove Combat Command B of the 4th Armored forty-four miles (70 kilometers) in fifty hours, capturing 5,000 German prisoners and causing the front to collapse. On March 7, the 4th Armored was on the Rhine. Major General George S. Patton's 3rd Army began to drive around the German 1st and 7th Armies to cut them off from the Rhine River and annihilate them. Despite Reichskanzler (Reichchancellor) Adolf Hitler's order not to withdraw, Generalfeldmarschall (Field Marshall) Albert Kesselring permitted a withdrawal behind the Rhine. On March 25, the 4th Armored and Patton's 3rd Army crossed the Rhine in pursuit.